Prowess is a two column blogger template with sidebar to its right and post section to left.The theme is designed by web2feel and converted by me to blogger.The design is cool and it looks beautiful and clean.Two Top menu links are ready for you.Seo for title has been done and it supports all blog features and is compatible with all browsers.Template consists of two menu links,one below header and one above.Search bar is also ready at top, i.e to right of second menu link. Other blogger templates you may like are BrandNew Folio and dClean. Nice shearing. I like 2 column blogger template. Thanks. hi i love this theme!! but could you please change the comment part to make it look like the real one? @daryl if you want same comment copy use this conversion.AS i dont like making same comment system as blogger keeps on adding feature to it so making chnage codes for you in comments in near future would be difficult for you to do them. 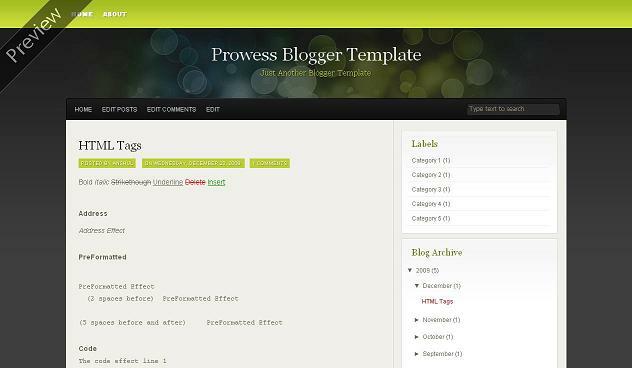 Hi, I'm using the Prowess template, but I can't change the color and fonts configuration through the Blogger tabs. Could you help me? @giovanni no channging colors will not work with blogger tabs for my templates and not for any other also.As for our templates you have to edit colors and fonts from template css in edit html.which ony can be done if you know css.